Azimo, the London based digital money transfer service, announced today that it has raised an additional $20 million in financing. The funding will advance Azimo’s mission to be the world’s leading low-cost, mobile and social money transfer service. Global money transfer is a half-trillion dollar market which is rapidly going online, with customers seeing the benefits in speed, cost and convenience. The emergence of native mobile options like Azimo will only intensify this trend. The Series B funding round was led by Frog Capital, with participation from MCI Investments and existing investors*, including e.ventures and Greycroft Partners, among others. Azimo is a world leader in online and smartphone-based money transfers – providing a fast, secure and low-cost alternative to legacy high street remittance services. Founded in 2012, the company has built the most comprehensive network of any digital player, sending money to over 200 countries, reaching 5 billion people with over 80 different currencies**. 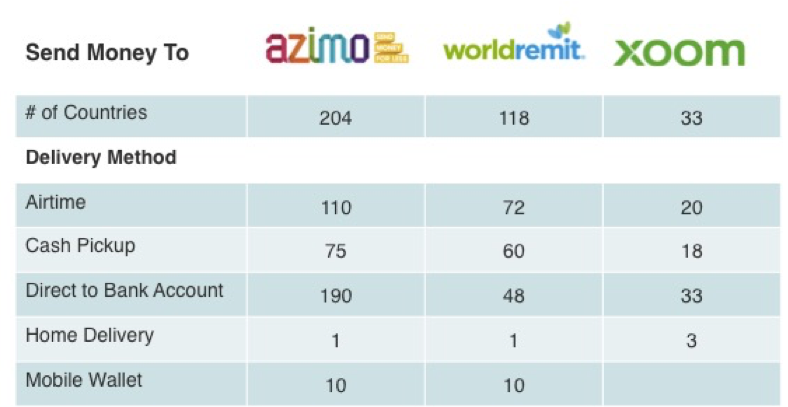 Azimo’s five-fold increase in money transfers in the last year reflects the on-going disruption of the $600 billion global remittance market. Digital and social network usage is helping workers send money home directly; saving money and time. Azimo’s announcement coincides with the International Day of Family Remittances, which aims to raise awareness of the importance of migrants transferring money home towards global development and local communities around the world***. The company will use this latest financing to continue its pan-European growth and to target new markets in North America and Asia. Azimo's management team has unrivalled depth and knowledge of the sector having founded Small World Financial Services in 2005, and building it into Europe's leading independent, traditional money transfer company. Azimo founder and CEO, Michael Kent said: “It’s fantastic to be announcing our latest round of funding on the inaugural International Day of Family Remittances, which recognises the huge contribution made by migrant workers to their families and communities back home. Azimo’s advisors on this funding round were FT Partners and Dorsey and Whitney. *Existing partners include Greycroft Partners, Accion's Frontier Investments Group, e.ventures, TA Ventures, Anthemis, RI Digital Ventures and KRW Schindler Investments. **Recent Azimo research has shown that the London-based company has the most comprehensive network of any digital player. Azimo is a London-based online money transfer service, changing the way people send money around the world. Honest, transparent and social, Azimo is the cheapest and easiest way to send money to over 200 countries across the world, from any internet connected device. Frog Capital is a leading growth capital investor focused on technology-led businesses in Europe. Frog’s experienced team has invested in over 100 companies, and in the last five years has exited companies with a total transaction value over €1 billion. Frog is a committed long-term partner, investing in ambitious companies with revenue up to €30m and requiring up to €20m of growth capital. By applying industry knowledge, a network of relationships and operating expertise, Frog actively supports exceptional company growth and builds significant shareholder value. MCI is one of the most dynamic private equity groups in Emerging Europe focusing early stage, growth stage and expansion/buy-out stage investments in CEE Region, Germany and Austria, CIS and Turkey. With assets under management of over $450m the MCI Group has closed over 60 investments with 30 full exits generating a net average IRR since 1999 of 20-25%. MCI Management SA is listed on the Warsaw Stock Exchange and is also a member of the Polish Private Equity Association.